Four oil painting scenes of Catoctin Mountain View Farm by Andrea Myers Mannix, daughter of Rodman and the late Jean Myers, are currently on display at the Thurmont Regional Library, through September 10, 2017. 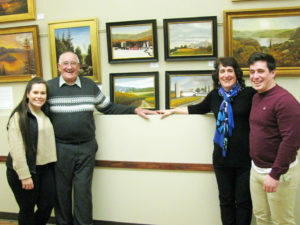 The paintings are displayed near the Thurmont Center for Regional Agricultural History Room. In April 1962, C. Rodman and M. Jean Ogle Myers purchased Catoctin Mountain View Farm on Smith Road in Thurmont from Harry and Marie Zentz. In 1967, an additional farm was purchased from William and Lola Zentz; and, in 1969, an additional farm was purchased from Claude and Martha Favorite. Catoctin Mountain View Farm consists of 425 acres, with its main crops consisting of corn, wheat, barley, soybeans, hay, and straw. Until 2006, Holstein cows were milked, and now steers graze the land. In early 2017, Andrea’s oil painting teacher, Kevin Cook (www.kevincook.com), held an exhibit of all his student’s work. The photo (above) is from the Artist’s Opening Reception, held on January 10, 2017, at New Paltz’s Elting Memorial Library. Andrea has raised her son and daughter in New Paltz, New York, and resides there for her job as an IBM Project Manager in Human Resources Corporate Business Applications. New Paltz is in the Hudson Valley area of New York State, with lots of mountains, orchards, and beautiful scenery— just like the Catoctin area! Andrea Myers Mannix is pictured with her two children and her dad (from left): Denise Mannix, C. Rodman Myers, Andrea Myers Mannix, and Kevin Mannix.